New Everydots. Following a trip from Seattle to home (northwestern Minnesota) and back, I have a few new photos. Wallace, Idaho is a mountainous town under and along I-90. It’s interesting in that it appears to have a tourist draw, but at the same time it’s still got some nice stale 50s and 60s-ness to it. Hebron, North Dakota is the Brick City and home to, of course, Hebron Brick. 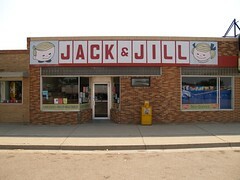 Killdeer, North Dakota, on Highway 200, feels a bit like the Wild West, except for the well-paved streets. Florian, Minnesota is not much more than a crossroads, but it’s known for its church and park. Girard, Minnesota is quite literally just a wide spot in the road, near Crookston. Finally, there’s Eldred, Minnesota, not far from Girard, but still with a few visible bits of town, plus, most importantly, a sign.